Mary & I met right after Christmas of 2000. We stated dating in earnest in Janurary and our relationship grew into our loving and caring for one another. Mary moved in with me the first of April. Our relationship continued to grow and we got along great! We were engaged December of 2001 and the wedding was June 15th, 2002. We spent a week in Hawaii on our honeymoon. Together we have 5 sons, Robin, Ricky, Michael, Ross and Ryan. I was born in Sacramento, CA, on February 16, 1941, but grew up in Cottage Grove, Oregon. I have two older brothers and a younger sister. I lost both of my parents to different causes in 1968. I graduated from high school in Cottage Grove, worked and went to school at Willamette University and subsequently to the University of Oregon for four years majoring in Physics. I left the university in 1963 to enlist in the Air Force for four years. I married Caroline R. Stotler, while in the Air Force, on March 27, 1965. Our first son, Robin, was born in New York where I was stationed. After discharge from the Air Force, I moved back to Portland, with my wife and son, where I have worked since. I also went back to college and got my degree in Marketing. Caroline and I had two addtional sons, Ross in 1972, and Ryan in 1973. I started a Manufacturer's Rep business in 1986 and I am still doing that. In 1993, Caroline died from congestive heart failure. Mary was born on September 11, 1944 in Rockville, Maryland, and that is where she grew up. Mary has enjoyed the experience of living in several different states, and says that "Oregon is the only place to live". She moved to Oregon in October of 1999, and she has finally found home! Mary was the third child of eight. She has an older brother and an older sister, two younger brothers and two younger sisterss....another sister died in a car accident when she was only 18 months old. Mary lost her mother in May of 1987 and her father August of 2002. 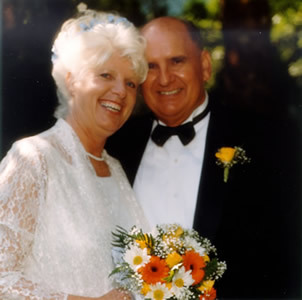 Mary graduated from Richard Mongtomery High School in Rockville, Maryland in 1963, and married in 1965, had two sons, Ricky in 1968, and Michael in 1970, raised them and was divorced in 1997. After Mary's divorce, she went to Angelina College in Lufkin, Texas and graduated in May of 1999 with a degree in Human Services and a Certificate for Activiy Director. Mary, as co-owner, works in the office as Office Manager.